What I love about this scene is the action in it. 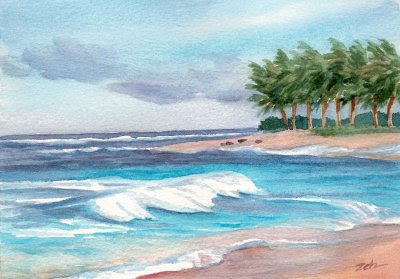 The tropical breezes are blowing the palm trees and the surf is crashing in to shore. The north shore of Hawaii has the largest, most spectacular surf in the world at Waimea Bay. But it can be dangerous in winter with powerful rip tides and swells reaching to 30 feet. Summertime is the time to enjoy taking a swim here! In any case, I'd love to be there just to watch the surf rush in.